About this time last year AMD released a video of it’s first generation FX processors setting a world record as the highest overclocking CPUs in existence. About a month later, the whole house of cards came tumbling down when reviewers had the less than enjoyable job of letting the world know that actually, AMD’s new FX chips were pretty “meh” in terms of raw performance. Those were undoubtedly hard times for AMD fans and Intel fans alike as the FX series of processors failed to drastically alter or invigorate the high-end desktop PC landscape. A year later, and despite the launch of Intel’s Ivy Bridge based chips, the mid to high-end desktop PC market is still stuck in pretty much the same rut. To AMD’s credit when that overclocking video went up last year it did manage to spark some interest from non-enthusiast PC users, but since then interest in this market space has certainly died down a bit. With Windows 8 launching in just a few days, I’m sure their are some of you that are wondering why AMD would even bother launching another FX chip, especially after AMD’s CEO declared earlier this that AMD was done trying to chase the performance crown. The answer to this question lies in the high margin, and comparatively low volume market that the server version of this chip addresses. The core design that AMD is using for this Vishera chip is a direct copy of the design that it’s using for Seoul and Delhi server chips. Because of this shared design AMD is only required to make a rather small investment in order to bring new FX chips to market. Will high-end CPUs from AMD disappear in the coming years? Well at this point it’s hard to tell; the chip we’re reviewing today, Vishera, is the only high-end CPU on AMD’s current road-map which was released back in February. But AMD recently reaffirmed its commitment to competing in the server market in its most recent quarterly earnings call, so I’d be willing to bet that we’ll be seeing a Steamroller based FX chip around this time next year. Now that I’ve mused about the future of AMD’s FX line for a bit, it’s time to get down to the raw performance numbers of the FX-8350 chip that AMD sent us to review. Right out of the gate AMD’s FX-8350 is slower than Intel i7-3770K in Cinebench’s single threaded rendering test. Notably, Vishera is a little bit faster than the A10-5800k that we reviewed at the beginning of the month in-terms of single threaded performance. In the multi-thread benchmark the FX-8350 is able to stretch it’s legs a bit more and offer 9/1oth of the performance of a 3770K. In our Paint.NET benchmark AMD’s FX is about two seconds slower than the 3770K, which is not a bad result all things considered. Our TrueCrypt benchmarks turned out one of the FX-8350’s stronger points today. In-terms of raw AES encryption bandwidth AMD’s FX processor was able to provide 90+ percent of the performance that the 3770K offered. But when doing ATS encryption, which is an option that layers three different encryption algorithms on top of one another, the FX-8350 is actually able to out perform the 3770K. It’s the first, but not the last, outright win AMD’s new FX CPU will see in our testing. Our two contenders are basically tied in Handbrake, with AMD’s FX taking just ten more seconds to finish the almost seven minute benchmark. 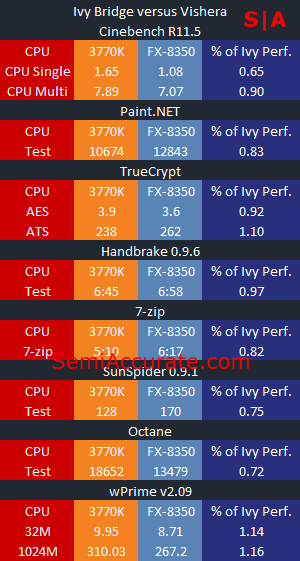 The SunSpider test illustrates the relatively weak single threaded performance that AMD’s second generation FX CPU offers. The FX-8350 offers only 3/4 of the performance that a 3770K can muster in this benchmark. Google’s Octane benchmark tells a similar story with AMD’s FX losing by about the same margin. 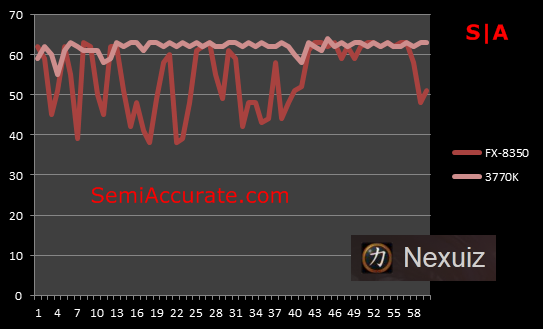 Our final number crunching benchmark, wPrime, turned out to be a bit of a coup for AMD. In the 32M test the FX-8350 is 14 percent faster than the i7-3770k, and in the 1024M test it’s able to extend that lead to 16 percent. In purely CPU based benchmarks AMD’s FX-8350 is unable to slay Intel’s i7-3770K. But it does beat it in specific tests and excluding benchmarks that can’t take advantage of its eight cores very well it’s within spitting distance of the i7-3770K. Now it’s time for some gaming benchmarks. We chose three games to test with today; Battlefield: Bad Company 2, Counter-Strike: Global Offensive, and Nexuiz. All of these game had their quality settings maxed out, Vsync disabled, and were tested at a resolution of 1080P. We used an HD 7970 Ghz Edition on both platforms to minimize any potential GPU bottlenecks that might effect our results. 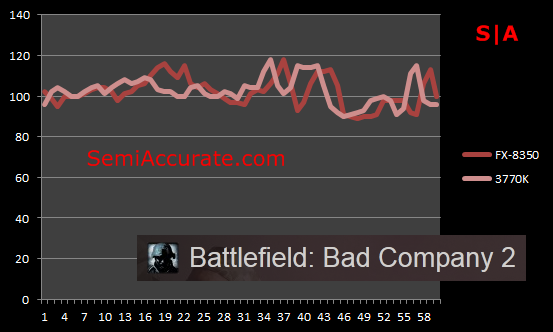 In our Bad Company 2 benchmark AMD’s FX and Intel’s i7 are neck to neck. There is basically no difference between the two in-terms of raw frame rates, and there was certainly no subjective difference between the two in-term of game play fluidity. 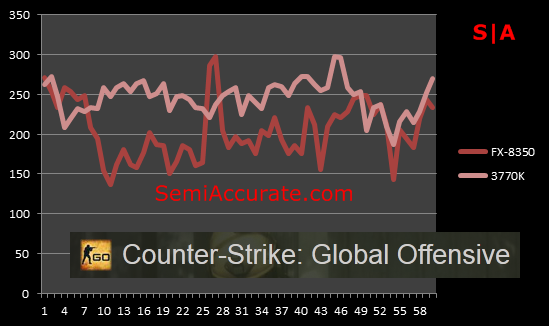 Moving on to Counter-Strike, we can see a significant performance disparity between the FX-8350 and the 3770K. But to the credit of both CPUs the frame rates were so high to begin with that their was no subjective difference between the two platforms. Nexuiz is a game that uses the same engine as Crysis 2, but caters to a more mainstream audience. In this game the differences in frame rates was significant, and the 3770K was definitely faster. Subjectively it was easy to tell the two platforms apart due to the frame rate troughs that the FX-8350 experienced. Overall both processors provided totally playable experiences, but the 3770K had the edge over AMD’s FX. Looking back at our article on Trinity, we noted that that chip offers approximate 60 percent of the CPU performance that the 3770K could muster. Well using the same methodology, AMD’s FX-8350 offers 91 percent of the performance that a 3770K on an equally configured platform can bring to the table. The strength of AMD’s FX processor is its modular approach which allows it perform well in multi-threaded applications. Of course the obvious caveat to this is that single threaded performance, while better than Trinity, still pales in comparison to what Intel is offering. 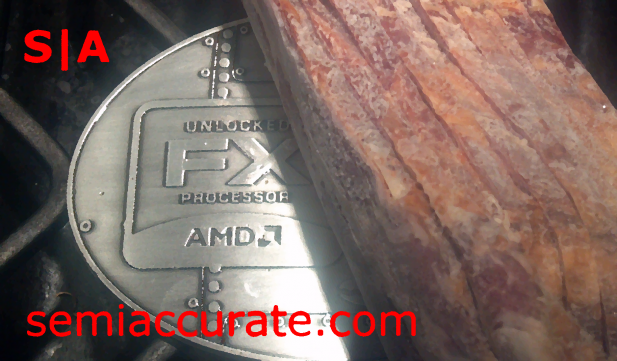 The one saving grace of AMD’s second generation FX chips is an aggressive pricing structure. When it launched the FX-8150 had a MSRP of $245, of course this price quickly dropped, but this time around AMD is getting even more aggressive by set the initial MSRP for the new FX-8350 at only $195. If we were to look at this from a performance per dollar perspective AMD is offering 9/10th of the aggregate processing power of a 3770K for less than 2/3rd of the cost. Which seems like a pretty compelling value play. There are a couple more points I’d like to make about Vishera before we go. First off the FX-8350 is socket AM3+ compatible, which means that it’s technically capable of working in any motherboard that has an AM3+ socket. At the present time there are a number of motherboards whose BIOSes have not been updated to support Vishera based chips. After checking with AMD we are happy to report that they expect the motherboard vendors to roll out updates to all AM3+ motherboards at some point in the future. Another thing we noticed is that AMD is telling the press that Vishera has a die size of 315mm2 and a transistor count of 1.2 Billion. If these numbers seem tantalizingly familiar to you that would be because they are the same numbers that AMD gave out for last year’s FX chip, Zambezei. We sent AMD an e-mail asking them to confirm these numbers, and received an affirmative response from them. So while Vishera utilizes the new Piledriver core, it appears that the physical characteristics of Vishera haven’t changed in any big way compared to last year’s Zambezei.